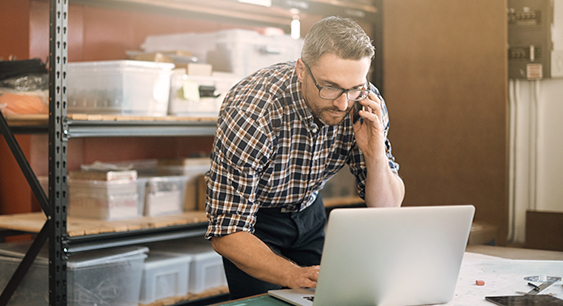 If you've decided to invest in business broadband for your small business you may want to think about the type of package you'd like to buy. Here, we run through a list of features to consider when choosing a broadband package and explain exactly what they mean. One of the first things to consider is how fast you need your business broadband connection to be and how many people will be using it. Business broadband packages in general start from 8 Mbps and range up to 24 Mbps. If only one person in the business is using your connection, speed may not be a critical factor and you could save money by switching to a slower connection. But if you have multiple users, you may want to consider an upgrade. Do ask yourself, 'would a slow connection reduce the productivity of you or your staff?' Similarly, do you have any business-critical operations that depend on the speed of your broadband connection? These considerations together should give you a good idea of how fast your connection realistically needs to be. The good news is that, with business broadband, you can always guarantee that your connection will be faster than a domestic connection of the same speed. This is because business broadband packages give you a lower contention ratio, which simply means that less people will be using the same server as you to access the internet. Another important factor to consider is whether or not your business needs unlimited downloads or if it can cope comfortably without them. Many businesses find themselves on a business broadband tariff that includes unlimited downloads, which costs them more money than they need to pay. If you run a small business with just one user who accesses emails and the internet, you could save money by agreeing to a download limit. Alternatively, if you find you're being charged exorbitant rates for exceeding your download limits, an unlimited package may suit you perfectly. Technical support is one of the most important features to consider when choosing your business broadband package. You need to ask yourself the question - what is more important to you - service or cost? Again - do any business critical functions rely on you having a working broadband connection? If your internet connection were to go down, would it affect your profits of productivity dramatically? If so, you may want to consider a supplier with excellent technical support with tight service level agreements on repairs. Finally, the price you pay for your business broadband will usually have a bearing on your decision when choosing a package. Ultimately, the cost of your broadband will depend on your answers to all of the questions above. If you want unlimited downloads, high speeds and excellent customer service, you may have to pay more than a 'cheap-as-chips', budget supplier is charging. But, if cost is your main consideration and you just want the cheapest broadband that actually works, we can help you with that too! If you're still unsure which business broadband package could benefit you, or if you simply want to know the best deal available, call us today on 0800 970 0077 and one of our business saving experts will gladly talk you through the options that could be best for your business.